Why Couldn’t the Jews and Greeks Just Get Along? It’s hard for me to get into Chanukah. As far as I can see, the whole thing was a major disaster. Here we have a meeting of two rich cultures, with so much to share, so much to contribute to the world together, so much synergy that could happen, and instead, BOOM! — the extremists of both sides hit the battlefield. I don’t get it. The Greeks were universalists. They were open to new ideas from wherever they came. They spread knowledge and understanding throughout the Mediterranean. Here was an opportunity to take Jewish values to the world, to go public. Why couldn’t those Maccabee hotheads work out some sort of compromise? Actually, this was the greatest thing that could have happened to the Greek mind: To discover that one thing it could not tolerate — something like the massage therapist who helps you to find that one trigger point where you can’t be touched. For the Jew, as well, this was a defining experience. The red lines became clear, and with those guidelines, the essential Torah was made able to survive to this day. You’re right about one thing: The whole Chanukah story was completely out of character for Ancient Greece. I don’t believe there was any other culture they ever oppressed or forbade. Every new culture had its set of gods and rituals, and that was just great. “Hey, you got gods? We got gods, too! Here, let’s trade god cards! How ’bout mix and match? You got rituals? You got belief-systems? We’re into all that stuff! We’ll even help you make big, pretty statues!” Greeks were great syncretists — meaning, they could jerry together every culture of the known world and make one big tzimmes out of all of it. So what on earth did they have against the Jews? Sure, there were political power-plays going on that were the ostensible reasons for the conflict. But it’s obvious there was something deeper at play. Some subliminal annoyance that brought out the worst in the Greek and pushed theMaccabees to revolt. Apparently, there was something about the Jewish mind that didn’t mix and match. Now look at it from the Jewish side: Jews have also borrowed from every culture they’ve come in contact with. Whatever your grandmother tells you, Abraham did not smear his gefilte fish with chrane. One culture we borrowed more from than perhaps any other was that of Ancient Greece. The Talmud tells us that the only language the Torah could be translated into elegantly is Greek. They said it was a beautiful language. They say that of all peoples, the Greeks had ideas closest to ours. They praised many of the Greek philosophers. Maimonides wrote that Aristotle was half a prophet. The Seder Hadorot, a kind of classic Jewish history book, claims that Aristotle was really Jewish! So what is going on here? Why such a violent clash? Why were the Jews unable to work out some sort of compromise with a Hellenist ruler? We need to know because in a very real way, Chanukah lives on. Our society today is a bizarre grafting of these two cultures, the Hellenist and the Jewish. If this conflict existed back then, the question is, has there been some resolution over time? 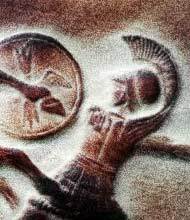 Or are we still fighting Greek elephants? Simply put: Is our society schizoid? Greek: So tell us about your gods, Mr. Maccabee. Greek: Okay, tell me about your gods. Jew: No, not you. G-d. G-d is singular. Only one god. Greek: Don’t worry, we’ve got so many I’m sure we can spare a few. Jew: That’s okay, one is enough. Greek: So, this one G-d, what does He look like? We’d love to make some nice statues for you. You poor, uncultured people, you have no statues! Jew: That’s because He doesn’t have looks. Greek: No looks? Ugly? That’s cool! A god of ugliness! Don’t worry, we can make ugly statues, too. Jew: No, no. He has no looks at all. You can’t see Him. Greek: An invisible G-d? Well, maybe we can do that in glass. But you have to give us some description. Jew: Nope. Sorry. No description. Greek: You mean nobody ever saw Him? How can you worship something if you don’t know what it looks like? I mean, how do you know He exists in the first place? Jew: It’s not that we don’t know what He looks like. He doesn’t have any looks. He has no image. Greek: Well, I’m sorry then. If He has no image, we can’t make a statue. Jew: That’s fine with us. Greek: But we’d like to write books about Him. So just give us some definition and we’ll work around it. Jew: Oh, our G-d can’t be defined. Greek: Come, now. Everything has to have a definition. Or else it’s not a thing. J: But G-d is not a thing. He creates things. But He isn’t a thing. G: Oh! So He is the Cosmic Mind Who conceives and shapes all forms from the primal essence-matter. J: No, He doesn’t just form them, He creates them. Out of nothing. G: Now you’re getting silly. You can’t make something out of nothing. You need stuff to make it out of. J: But there wasn’t any stuff when things began. G: There was always stuff. How else could the Cosmic Mind make anything? J: No, He’s not just the Cosmic Mind. G: Well, nothing’s higher than the Cosmic Mind. J: Because that’s not who He is. I mean, even if He didn’t make a world, He would still be G-d. So you can’t say, “that’s who He is — the One that makes a world.” There doesn’t have to be a world for Him to exist. G: Of course there has to be a world. Otherwise, why is there a world if there doesn’t have to be one? The world makes sense. The Cosmic Mind makes sense. That’s what it’s all about. Reason. The highest and most perfect of all things. We Greeks will teach you all about that. So, now tell me about your rituals. We Greeks really dig rituals. Any that have to do with wine? Parties? J: Sure, we make kiddush on Friday night to commemorate the Creation of the world from nothing. G: Well, you can give up that one now, since I’ve just shown you that creation of the world from nothing makes no sense whatsoever. J: We don’t eat milk with meat. J: Reason? He needs a reason? For the same reason He created heaven and earth! J: He just wanted to. G: That’s not a reason! J: Sure it is. He decided He would like a world where there would be milk and meat and He would tell people, “Don’t eat that milk and meat together!” and they would listen. G: That makes no sense. That’s not a reason! J: Reason is just another of His creations. G: Reason is the ultimate! There is nothing higher than Reason! J: Okay then, explain to me why the world is the way it is. Why does one plus one equal two? Why does the square of the length of the hypotenuse equal the sum of the squares of the lengths of the other two sides? Why do parallel lines never meet? G: Because those are the rules of geometry! J: So why does the Cosmic Mind, as you call Him, have to follow your rules of geometry? G: They’re not our rules! They are the self-evident truths of nature! J: Why are these the truths and not something else? G: You stubborn Jew! Don’t you see that this is the most elegant, rational way things could be? J: I’ll bet you He could break them. I’ll bet our G-d could make a world where parallel lines meet. He could break any of the laws of nature. G: You can’t break laws of nature! They’re not like laws of the state or like your silly laws about cheeseburgers. They are truths. They are perfect. They are the ground of reality. They are because they have to be. J: Nothing has to be. Nothing but the Source of Being. But He could be any way He wants. G: Geometry has to be. Cause and effect has to be. Logic has to be. If A = B then B = A. That is an absolute Truth. It must be. G: Why?! Because if they don’t have to be, then I and you and this whole world have no real substance! And that cannot be! G: Don’t say it, Mr. Maccabee! You people are downright dangerous. And that is why the Greeks did not forbid Jewish practice altogether. What they (initially) forbade were those practices that they saw as irrational. Those practices that Jews do simply because they believe they have a relationship with a Being who is higher than reason. That, they could not tolerate. Of course, as you know, eventually some bright boys came up with geometries where parallel lines meet; cause and effect got bumped out of quantum physics; the world was discovered to have had a beginning; and even now it still is really nothing because the sum of all radiant energy minus all of the universe’s mass equals zero. Most of us today have accepted that there are things that are the way they are not for any reason, but just because that’s the way they are. Nothing has to be the way it is. Why do masses attract? Why is the grass green? Why is there anything at all? There doesn’t have to be a reason for everything, because reason is not the foundation of reality. So what’s so absurd about connecting to the Foundation of Reality through mitzvot that are beyond reason? Nevertheless, the battle continues. You see, as mentioned above, the Greek mind, aside from worshipping human intellect, is also a great syncretist. That means it can hammer together the most incongruous ideologies without blinking an eyelid. You’ve heard of Rice-Christians? Peyote-Catholics? The Greek mind could do any of that, and more. The two characteristics go hand in hand: When there’s nothing higher than intellect, intellect has no guiding light. Everything, even the stupidest thing — as long as it doesn’t deny intellect — can be tolerated. Aristotle knew that the pantheon of Athenian gods was nonsense. But what’s wrong with the common people, who cannot understand any better, having their way? You can easily see that a knowledge of an absolute Divine Will beyond reason has become a necessity for human survival. Without the supposition of a Divine Will, whatever you wish to make sense can make sense. If your system of logic cannot support an idea, just change the postulates and rethink the data. Anything can be made to make sense when you determine the assumptions. Every society has had its philosophers and philosophers have justified everything imaginable — from coliseum killing games to gas chambers. Strangely, this may have worked to humanity’s advantage in one regard: The Greek mind applied itself to figuring out the material world. When your belief system begins with Divine revelation you don’t necessarily apply yourself to mundane matters of how things work. So technological progress became chiefly the domain of the Greek mind throughout history. But it also has some nefarious consequences. Because when you marry intellect and materialism (a good description of Stalin’s Russia and Hitler’s Germany), you’ve entered a bottomless pit of quicksand. Which brings us to a fascinating point. The Lubavitcher Rebbe points out that in Hebrew, the name for ancient Greece, Yavan, has another meaning: quicksand (as in Psalms 40:3 and Talmud, Eruvin 19a). Water mixes with sand, dirt and clay. You step in it and you can’t get out. The more you try to climb up, the further down you go. Take a look at the letters that spell Yavan in Hebrew: יון . It starts with a small point of a yud — representing wisdom. That stretches down to become a vav. And the vav stretches even further down, below the line, to become a long nun. It’s all a description of the process of intellect sinking into the material world and, with nothing to hold it in place, sinking further and further. Today, we have those syncretists who wish to marry materialism with Torah. And nothing is less congruous than that. Materialism is the ultimate of Greece stuck in the mud. It is the idea that all that exists is that which can be observed, described and explained. Evolutionism, for example, is a materialistic explanation of existence. When people became disillusioned with the church and with faith, they needed an explanation of existence that relied on Chance and Necessity alone, without recourse to G-d. Darwinism and current cosmologies provide just that. So do the standard interpretations of history we are taught today. Torah is an understanding that behind the world lies a Divine Will, unhampered by the limitations of nature or human logic — because it is the source of all this. Why are there laws of nature? Because G-d generally chooses to work in consistent ways. Why did history unfold the way it did? Because that is all in G-d’s plan. When someone tries to provide a materialistic explanation for Torah and mitzvot, they are creating a Procrustean bed, killing all sense of Torah in the process. So too, attempting to resolve conflicts between evolutionary doctrines and Torah makes less sense than marrying a donkey to an ox. Yes, we try to understand as much as we can. The Torah commands us to think deeply, to immerse our intellects in study and comprehension. Whatever we can fit into intellect, we must strive to do so. Whatever explanation we can give, we must give it. But always with the sense that with every new grain of understanding, we have expanded the seashore of the Infinite Unknowable. We can have a thousand reasons for not mixing meat and milk, but when it comes down to it, we do it because that is our personal connection with the Divine Will, the Life of All Things. And that is the victory of Chanukah. Segun tomado de, http://www.chabad.org/holidays/chanukah/article_cdo/aid/789831/jewish/Couldnt-the-Jews-and-Greeks-Get-Along.htm el lunes, 8 de dic. de 2014. Previous Post Why Do Jews Give Two Names?